HMCS MAGNIFICENT, known as the Maggie to one and all, served in the Royal Canadian Navy from 1948 to 1957. During that time, she travelled the globe showing the flag and participating in various naval exercises, and in 1956 she delivered Canada's contribution to the UN Emergency Force in the Middle East to Port Said. The late Claude L. Murphy ("Murph") served in the RCN from 1949 to 1960. During this time he served on board the Maggie as a flight deck member, and he took with him a camera. All of the photos shown here were taken by Mr. Murphy, and he valued these photographic memories. It is not hard to see why. The quality of some is not the best, but others are excellent despite their 40+ years of age. They include photos taken on and of MAGNIFICENT, and also of her escorts and various other sights. I would like to give special thanks to Dan Murphy, his son, who kindly scanned them in for me. Thanks also go to Bob Cornish for identifying the final two photos. 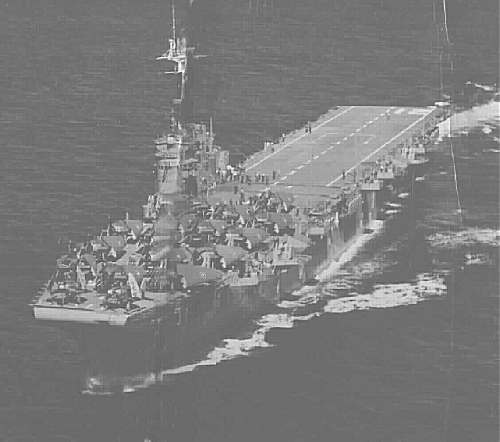 This image has seen better days, but is still a nice view of Maggie with her airwing strewn about upon her flightdeck. 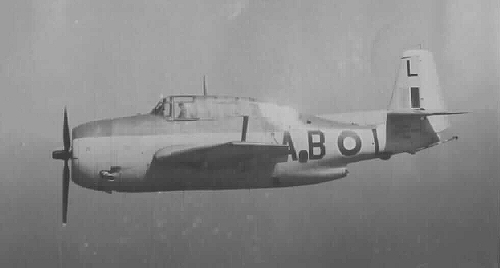 An Avenger Torpedo bomber. These WWII era planes continued to fly on into the 1950's as a part of Maggie's ASW wing. 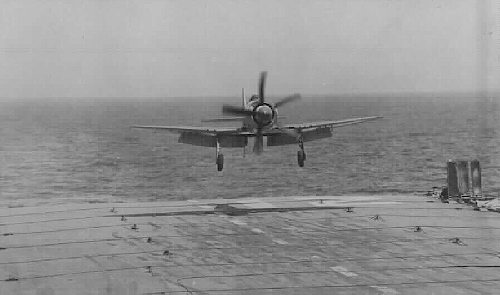 A Hawker Sea Fury on landing approach. 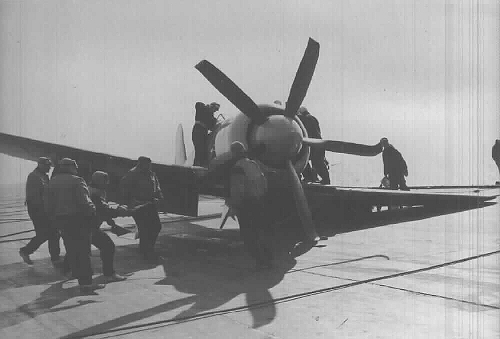 A Sea Fury on the flight deck. A beautiful photo in my opinion. A Sikorsky S-55 (H04S) helo. The predessor to the Sea King, this helo carried out ASW and SAR duties for the RCN. 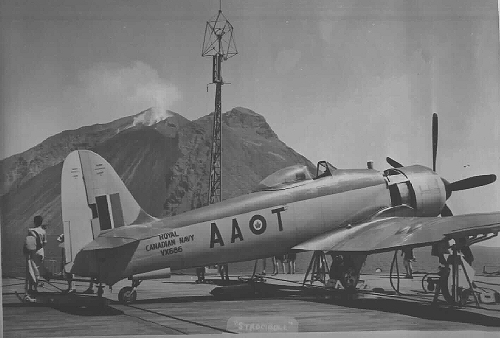 After the Maggie was discarded, the S-55 continued to serve for a number of years as a plane guard on HMCS BONAVENTURE. 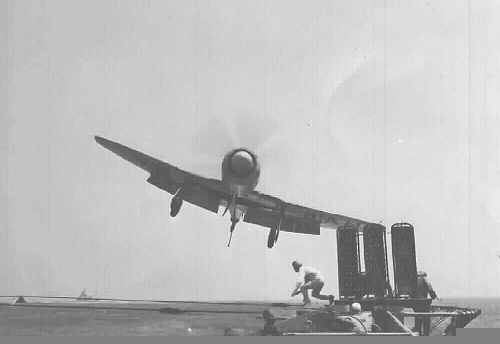 A Sea Fury being waved off while on landing approach to the Maggie. This Sea Fury bent itself all out of shape. Whoops! An Avenger in need of repair. A nameless carrier sits in Portsmouth Harbour as Maggie pulls in. 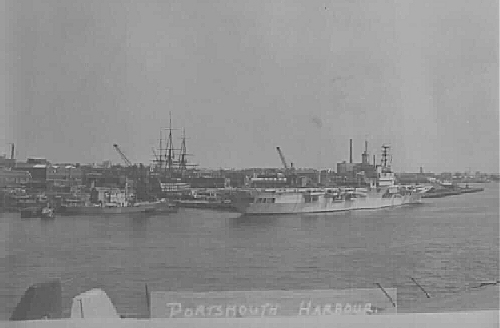 Note the masts, presumably those of HMS VICTORY, in the background. 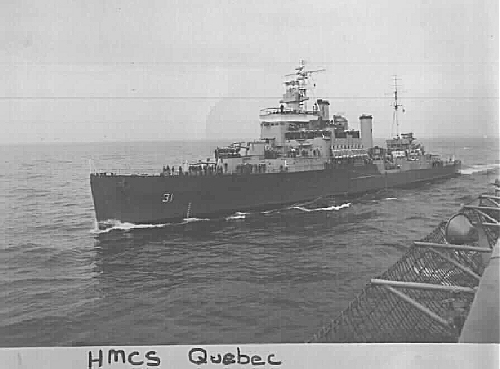 A rare picture of HMCS QUEBEC, one of two cruisers to serve with the RCN briefly in the post-war period. This dates the photo to somewhere in between the years of 1952 and 1956, as she spent her career up until 1952 known as UGANDA. Used as a training ship, she was paid off in 1956 and in 1961 she arrived in Osaka, Japan, to be scrapped. An A-Class submarine of the Royal Navy. 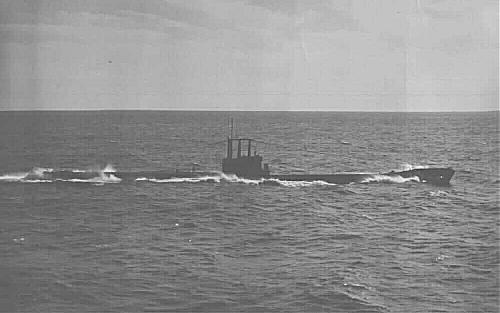 Often an A-Class sub would be stationed in Halifax during this period for training purposes. 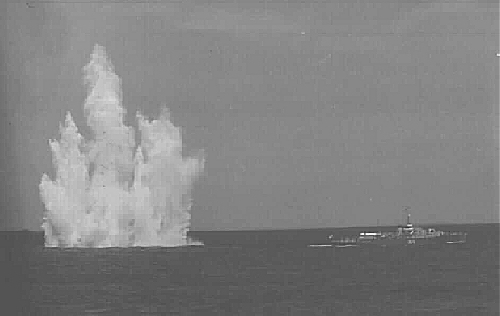 A destroyer (probably SIOUX) keeps just ahead of the blast produced by some of her depth charges. HMCS SIOUX. She was one of two V class destroyers to serve with the RCN. 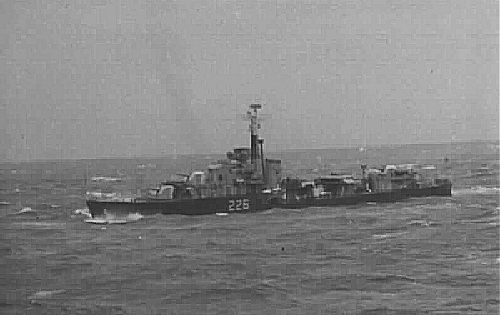 Her sister, ALGONQUIN, was converted into a 'fast ASW frigate' and resembled HMCS CRESCENT, a similiar destroyer which underwent the same conversion. SIOUX pulled three tours in Korea, and was eventually paid off in 1963. 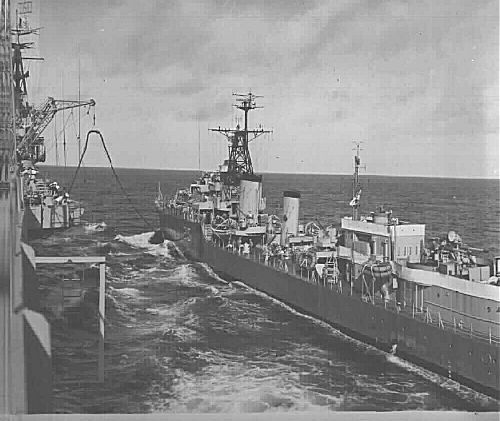 HMCS HAIDA is pulled alongside for a Replenishment At Sea (RAS). HAIDA is now a museum in Toronto. 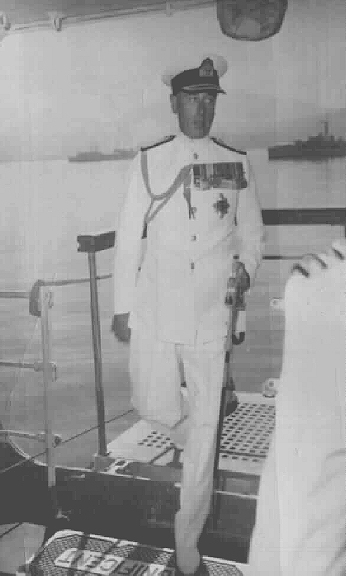 Lord Mountbatten boards the Maggie. 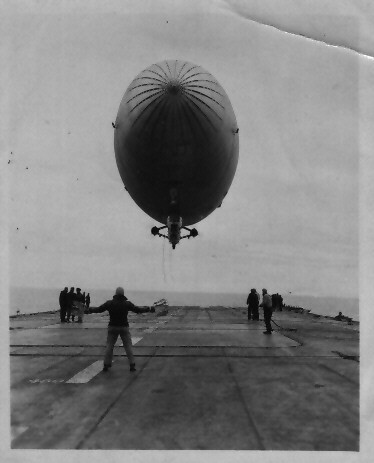 Written on the back of this photo are the words "1st blimp to land on a carrier". It was taken onboard Maggie during a 1949 cruise in the Caribbean, and the blimp belongs to the USN. 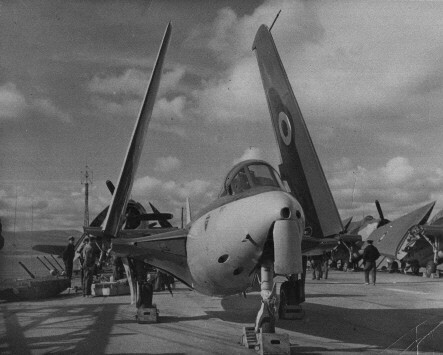 This is a Royal Navy Hawker Sea Hawk. 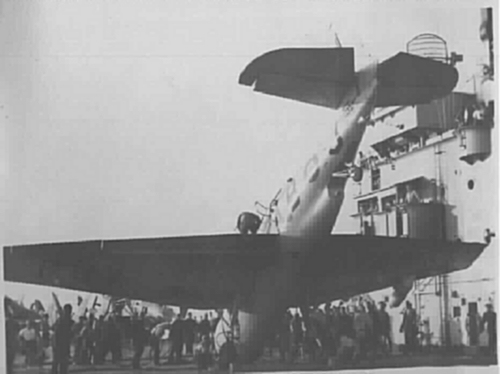 This type of carrier jet aircraft entered service with the Royal Navy in the mid-1950s. It was being shipped to Canada for cold weather testing in 1952. This section of the HG&UW site created and maintained by Sandy McClearn.